A ripple in a pond. The definition of a ripple is a small wave along the surface of water, a gentle rising and fall of sound throughout a group, or a special feeling that goes through you. 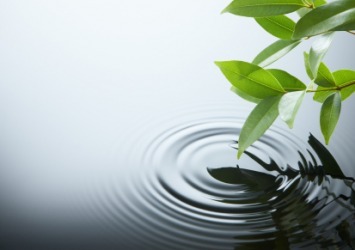 An example of ripple is a small wave that occurs when you drop a rock into a pond. An example of a ripple is a wave of laughter that moves through a group. An example of a ripple is a feeling of excitement that goes through you on your wedding day. To ripple is to cause the surface of water to form small waves, or the term for the action of the water when it makes small waves. When you run your finger through a bath, this is an example of a time when you ripple the water. When the water goes up in small waves, this is an example of a time when the water ripples. "ripple." YourDictionary, n.d. Web. 20 April 2019. <https://www.yourdictionary.com/RIPPLE>. a. To form or display little undulations or waves on the surface, as disturbed water does. b. To flow with such undulations or waves on the surface. To rise and fall gently in tone or volume. To cause to form small waves or undulations. A wavelike motion; an undulation: the ripple of a flag. A sound like that made by rippling water: a ripple of laughter. A comblike, toothed instrument for removing seeds from flax and other fibers. To remove seeds from with a comblike, toothed instrument. A moving disturbance or undulation in the surface of a liquid. I dropped a small stone into the pond and watched the ripples. A sound similar to that of undulating water. A style of ice cream in which flavors have been coarsely blended together. I enjoy fudge ripple ice cream, but I especially like to dig through the carton to get at the ripple part and eat only that. (electronics) A small oscillation of an otherwise steady signal. To move like the undulating surface of a body of water; to undulate. To propagate like a moving wave. To remove the seeds from (the stalks of flax, etc. ), by means of a ripple. (by extension) To scratch or tear. Middle English rypelen, frequentative of rippen 'to rip'. More at rip. A ripple of cold energy floated through her head and made her shiver. In many mystical Oriental religions the perfection of the human self is absorption in the infinite, as a ripple dies away on the surface of water. Wide, and is unsullied and wax-like white, each ripple and braided rill seeming to have been polished.